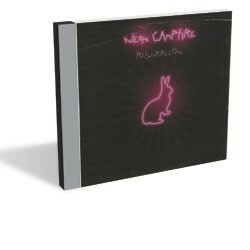 Neon Campfire are the brainchild of songwriters David Rosane and Denis Jaro Sinski. Rosane hails from Vermont originally, but the project was actually conceived and birthed in Paris. Last winter, the duo released a pair of albums simultaneously, Resurrection and The Bunny Tracks. Rooted in classic 1970s pop, the albums are an eclectic collection of emotionally charged, bare-bones rock and roll. Though not without occasionally heavy-handed nods to acknowledged influences such as the Velvet Underground, Iggy Pop and Nick Cave, Rosane and Sinski manage to infuse their musings with a uniquely charming sense of brooding melancholy. They use the archetypes constructed by their heroes as a springboard to share insightful, and often fearlessly vulnerable, observations on life and love — and the tragedy of eventually losing both. The Bunny Tracks is the shorter of the two volumes, clocking in at a scant eight tracks and just under 20 minutes. It’s also the quieter and more intimate of the pair. Tracks such as opener “We Are Éléphant,” “Dynamite the World” and, especially, “Sérial,” cast the duo in a distinctly sad-sack, lovelorn light. However, while their ruminations are often of the heartsick variety, Rosane and Sinski generally manage to avoid the hackneyed romantic clichés so prevalent in pop music. Instead, they trade in off-kilter meditations that attack as much with sly, tongue-in-cheek guile as heartstring-pulling sentimentality. Resurrection more overtly capitalizes on the duo’s lyrical whimsy and touches on a broader array of topics. Though their reflections on subjects such as environmentalism and ancestral bloodlines showcase similar inventiveness, the results are less consistent. The lead cut, “Isaiah,” is a touch too earnest for its own good. The faux-blues rock of “Loveland” feels forced and trite. And “Jungle Noogie” is a schizophrenic little oddity that switches gears so often, it’s more confusing than compelling. However, the disc also contains some of the band’s strongest work, including the darkly beautiful “Prophecy,” the even darker and more beautiful “Rock and Roll Suicide,” and the sweet, benedictory album closer, “Campfire Song.” All in all, Neon Campfire hit far more often than they miss. Though one wonders why releasing two good albums was preferable to trimming some fat and unveiling one great one. Neon Campfire play a string of Vermont dates this week: Thursday, July 21, at 51 Main in Middlebury; Friday, July 22, at Charlie O’s in Montpelier; Saturday, July 23, at the Purple Moon Pub in Waitsfield; and Tuesday, July 26, at the Bee’s Knees in Morrisville.